No finer book about the 19th century whaling industry has ever been written. There are exciting passages about the flensing of whales, gut-wrenching tales of the boiling of whale blubber, and don’t even get me started on the whole chapter about the absurdities of mid-19th century financial regulations regarding the opening of new whaling markets to operators of unlicensed leviathan hunters. This was one of my childhood faves, and all of my friends had read it as well. So, you’d think a bunch of 12-year-old boys would find this a laughable premise, a book about rabbits. Au contraire. Finding the site was less of an adventure than the book. Really all we needed was a nice secure spot, open enough to allow us to dig, but with a few nearby trees which we would use for lookout posts. We chose a section of the woods that was open, and half-pasture, but overgrown with grass and scrub bush. It was creating the warren that became the epic. Digging the first three feet of the “large central room”, which would be the hub of our new and magnificent clubhouse was easy. (Our goal was to dig the large room first — a 10′ x 15′ space — and then cover it with sod quickly, so the location of our hideout would remain secret.) In fact, none of our parents had occasion to ask why we were borrowing all the shovels it was going so quickly. It was just dirt we were digging. Then we hit the clay. It took us a week to get down another six inches. And another week to make it to four feet. Somewhere in there my mother asked me what we were doing with the shovels, and I mumbled something about looking for buried treasure before collapsing into bed. Week four saw us to four feet and three inches. We were definitely slowing, and the chance that we would keep this monstrous hole secret for much longer was rapidly fading. In fact, there were whispers that we should give up. (Most 12-year-old boys would have given up weeks before and moved onto other adventures.) However, we were a stubborn group, and the clay would have to end soon. But no. It just kept going. After another full week of digging, we were only down to four feet and seven inches. (Though the optimists among us thought it was four foot eight.) Some discussion of using the massive pile of clay that now surrounded our redoubt to make up the remaining one foot and four inches we needed to finish our planned hole. This idea was rejected as being too avant garde, and besides, the idea was that it would be a SECRET hideout, and even once the grass had finished regrowing, which would now take months, the lump would make our clubhouse too obvious. The committee was convinced. And it was decided that we would finish the hole this week, in a frenzy of effort. We would spend twice as long digging each day. Three times! No TV! No touch football! It would be done. It’s what Fiver would want! Fiver lives! We returned to our warren, filled with enthusiasm, imagining how sweet it would be when the hole was covered with grass on top, the walls and floor were rendered habitable by shag rugs, and we had some does in there, only to find our magnificent hideout had been co-opted by some local teens. The deep hole and surrounding wall of clay rendered any campfire perfectly safe and invisible to observers in the woods. (It even absorbed some of the sound teenage revelry.) The remains of a genius campfire lay in the center of the warren. Beer bottles and cigarette stubs decorated the well-trodden clay. So instead of becoming a secret hideout, filled with sweet-eyed does and brilliant rabbit wannabes, it became the best-known place to partake of jungle juice; it became the Party Pit. In retrospect, it probably saw more action this way then our clubhouse ever would have, doe-wise. Alltop loves the does. And the bucks. Originally published November, 2010. 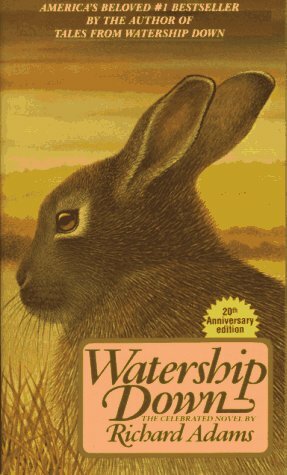 Watership Down changed my life. I was enroute to eating the traditional meat and potatoes before being swept up in this book. Then, I began my search for the ideal carrot. The rich rooty flavor even drove me to seek carrot muffins. The color orange dominated my vision and I would fall in love with everything associated with orange, even the New York Knicks. But the big impact in my life was the way this book changed my movements. I have hopped ever since my childhood. Hopping gives the jumper a more varied view of the world. I have learned how to hop around subway cars and even into supermarkets. My den is more organized than those of most people. I have dug into the wooden floor by nibbling at the wood when hungry. So I now have pockets in the floor where I can bury nuts. Well let me know what you think of this lifestyle. Tom, I have to say I approve of these lifestyle choices. It is especially nice to have many places to hid your nuts.